At those levels, UV light is quite harmless to human beings. It also won’t affect other multicellular life forms like household pets. Germs and single-celled organisms, however, have a much different response: the light either kills them outright or fuses their DNA,: preventing them from reproducing. That makes UV light an outstanding way to keep your home clean. The question becomes how best to deploy it. Obviously, you can’t simply cover your home in UV lights to keep it safe from germs. You need a place where they can do the most amount of good on an ongoing basis while using the least amount of space. The apex to the ducts of your central air conditioning system makes the perfect spot. Your HVAC system cycles air through the entire home when it does its job, pushing the air it’s just cooled through the apex on its way to the various vents around your house. The UV air purifier shines a line across the width of the ducts, such that no amount of air can escape passing through it. 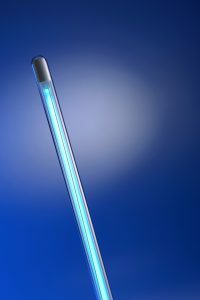 That sterilizes the air and scrubs it clean of germs, bacteria, and other unwelcome guests. It does so every time you turn on your AC, and will do the same thing with your furnace in the winter, ensuring constantly steady protection for your home at all times. If you think a UV air purifier makes a good fit for your Westlake, OH home, call Westland Heating & Air Conditioning today!